Please don't send me up the river of fashion shame to be forsaken and never heard from again. 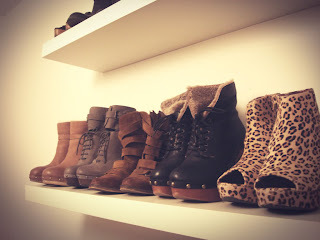 We all love Jeffrey Campbell their chic with edge and above all else their affordable. Although I have noticed this phenomenon amongst us fashion blogger's which happens to be the Jeffrey Campbell. So I ask does this solidify you as fashion blogger? Once you've worn a pair, are you automatically in some elite club? Does this take away from individual style? Or are they just beloved among us all. Don't get me wrong I still plan to purchase a pair I fall madly in love with. I just want to make sure I make the right decision for myself and not follow the wave. I honestly think Jeffrey Campbell has a shoe out there for every girl or boy, but I've noticed like I'm sure you have that almost every blog you click on that, that blogger owns a pair. No matter what none of us can deny the allure of Jeffrey Campbell shoes. They make you feel like most sickening person to ever walk in heels without breaking your bank. I'm sure we'll all feel the same way once we get our Loubou's, Giuseppe's, Blanik's on but until then... Hell even after then Campbell can be our go to guy. I think the reason Jeffrey Campbell is so popular with bloggers is because his designs are edgy, the shoes are SUPER comfortable (I have a few pairs) and they're comparably cheaper than designer shoes with the same aesthetic. Those are #winning traits in my book! agreed! and how has the hair been? I agree. I hate JC for this reason, everybody wear him. THose shoes are not so cool anymore!! i was "introduced" to the jessica simpson dany by the blogosphere, and wanted them badly...but it was because i really liked them and it was what i was looking for in terms of style (t-strap) and height (high enough for certain pants). they go with everything and i look forward to wearing them. on the other hand, i would not buy the litas...just because they aren't me...i'd have to force myself to wear them and it would take too much effort to "style" them. it's important to wear what YOU look and feel good in. i am so loving all the honesty ladies!!!! thank you all soo very much! i totally agree!! i love them but it shouldnt you shouldnt get them just to ride the bandwagon. i really love jc shoes, but only have one pair that i won from solestruck! but sometimes i dont buy certain styles bc so many people already have them and it starts getting cliche! I bought a pair of JC because I loved them!! I thought I have to have them. Funny enough now I want to sell em! Wearing JC does make you fashionable in short trendy but does it say you are stylish? maybe not....Its like saying the same for other major brands like Chanel or Christian Louboutin, or Gucci, A Brand is a brand. But incorporating a brand to fit your style is key.. Does Jeffrey Campbell make you a fashion blogger? No way... i love his foot wear designs because the heels are so edgy, fashionable yet affordable thats all, i have come to realise that fashion trends has many sheeps/followers people are to afraid to be there selfs or like different until DIFFERENT is over used and over rated then everyone once jumps on the bandwagon! Amazing outfit, I love your jeffrey campbell lita!